Bike Lanes | Huntingdon Landmarks, Inc.
Huntingdon Landmarks, Inc. fully supports the creation of bicycle routes through Huntingdon Borough, and has agreed in principle to work with private landowners and the Borough to make necessary improvements to their properties to accommodate wider on-street rights of way for bike lanes, or off-street bikeways where appropriate based on engineering studies. The paved circuit path through Huntingdon’s Portstown Park is enjoyed by walkers and riders of all ages. As home to Juniata College and three of Huntingdon Area School District’s school buildings, Huntingdon Borough has a significant resident and visiting population whose only means of transportation is a bicycle. As one of the oldest planned communities west of Tuscarora Ridge, Huntingdon was laid out with relatively narrow streets during colonial times, and accommodations have been made over time for on-street automobile parking, making travel lanes even narrower and risky for cyclists to pass between a parked car, whose door may open at any moment, and moving vehicles in travel lanes. Many neighborhoods in the Borough, especially in the downtown section have buildings built to the edge of the public right of way, restricting sight lines at intersections, another risk factor to bicycle safety. Huntingdon is currently home to sections of two PennDOT approved scenic bicycle routes in the Fishermen’s Loop and Spelunker Loop. Both of these routes, planned by the Southern Alleghenies Planning and Development Commission, are well-used and would benefit from the addition of bicycle lanes. Within a 10 mile ride of Huntingdon are trailheads for three very popular off-road bicycling destinations, namely the Lower Trail rail trail, the Allegrippis Trails at Raystown Lake, and the multi-use trails of Rothrock State Forest via State Game Lands 112. Huntingdon Landmarks is working with local businesses, organizations and artists to create bike racks as public art installations. 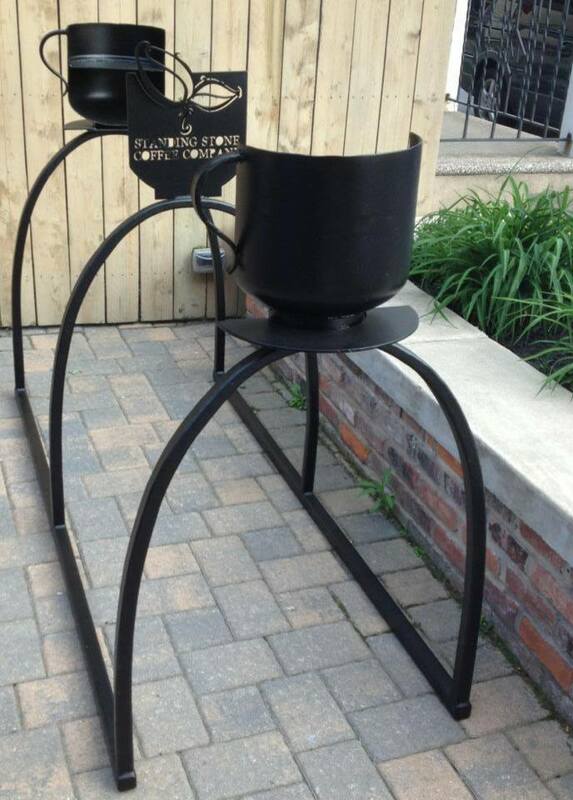 The first one is located at Standing Stone Coffee Company on Mifflin Street. 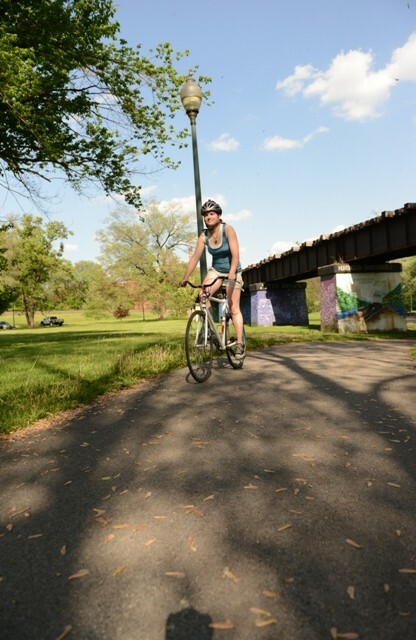 In addition to all of the bicycling attractions surrounding Huntingdon Borough, the Borough itself has cycling amenities that make it the commercial hub of a true bicycling destination. These amenities include a bike and skate park and paved loop trail in Portstown Park; and bike racks as public art installations at Juniata College, Standing Stone Coffee Company, St. James Evangelical Lutheran Church, Huntingdon Community Center, Huntingdon County Library, and Detwiler Field. Huntingdon Landmarks, Inc. will be working over the course of the coming years to install more public art bike racks throughout the Borough. The sport and transit mode of bicycling have led to economic development in Huntingdon Borough as well over the past 5 years, including the addition of bikes, bike accessories, bike service and bike rentals to the offerings of Rothrock Outfitters. Rothrock Outfitters has added 1 year-round full-time and 5 seasonal full-time employees since adding bicycle merchandise and services in 2009. Huntingdon Landmarks, Inc. is a 501(c)(3) corporation based in Huntingdon Borough whose mission is to promote and facilitate the preservation and economic viability of historic landmarks in Huntingdon. We sincerely believe that integrating multiple modes of transportation in the Borough and greater Huntingdon area is critical to keeping historic structures in Huntingdon economically viable. Many of Huntingdon’s best assets are best viewed on foot, or from the saddle of a bicycle.